Good News! The sunset this week is at 4:27pm here in Portland, the earliest of the year. From here on out into June the sunset will get later and later. The bad news is that it’ll only be about 10 minutes later even 3 weeks from now; it’ll be a long crawl out of the darkness of winter between now and mid February. Some clearing later tonight along with the long night and abundant moisture says fog and low clouds to me. Our RPM keeps some low cloud cover in the Valley through the entire day tomorrow (it IS mid-December isn’t it? ), so I lowered high temps a bit. We get a light east wind through the Gorge, but it’ll only clear out the west end of the Gorge, not the metro area. Not much eh? A tenth of an inch if we get lucky in the next 24 hours. By the way, 24 hours ago when this system looked like it was going to hold together, it looked like a first snow was possible in the eastern Columbia River Gorge all the way down to river level Thursday night. Our RPM was showing that and the WRF-GFS was extremely close with a light east wind and cold air trapped at the lower elevations. It doesn’t matter now since little or no precipitation will make it over there anyway, but interesting to note nonetheless. We get one more weak-ish system later Saturday night and early Sunday; this one appears to have splitting tendencies again to me. Another change in the past day appears to be 3rd much stronger system for later Sunday and early Monday. 00z models show around a 970 surface low heading towards (and then dying over) central Vancouver Island. This isn’t a damaging wind setup in the interior, and maybe not along the coast either with the slow movement. But it is a very windy and rainy period in both spots. This feature, showing the coldest atmosphere so far this season, has been relatively constant on the models for the past 4-5 days. 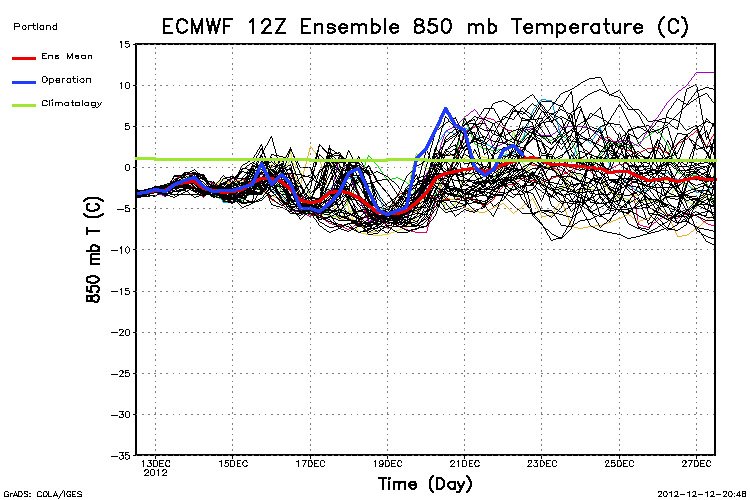 They have also been consistent showing that as THE coldest spot of the following 5 days too. We will probably see the lowest sticking snow of the season so far the middle of next week; possibly as low as 1,000′ in NW Oregon. If you live at/above 1,500′ you should at least see your first dusting (or more) during that time. Sticking snow near/below 1,000′ is looking unlikely based on current info. Still no need to put on studs if you plan to stay at the lowest elevations of western Oregon and southwest Washington. Lots of snow in the Cascades over the next week; at least 1.5 to 3 ft. total. SkiBowl should be able to open up early next week I would think. An important note about maps/models beyond Monday or Tuesday. There has been a huge amount of variation & disagreement on the long range the past few days. We are in a period of unusually high uncertainty about the long range weather pattern. 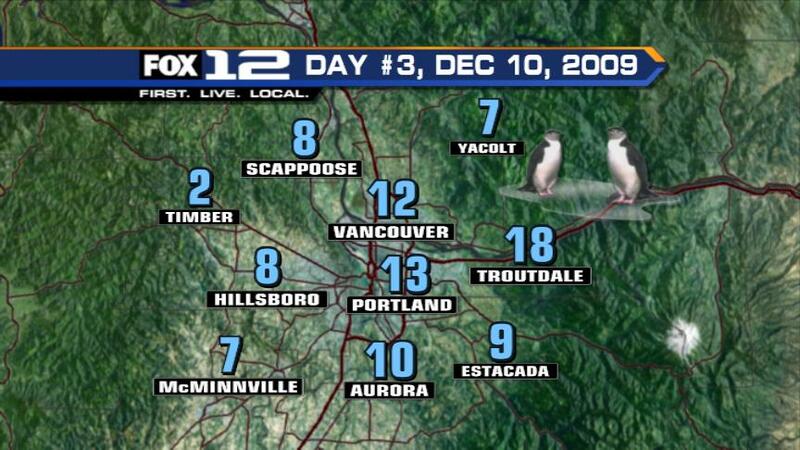 You are currently browsing the FOX 12 Weather Blog blog archives for the day Wednesday, December 12th, 2012.